Return to Photoville in Brooklyn. Henry and I headed to Brooklyn yesterday to celebrate our friend Joyce’s birthday while Jacqui attended a concert uptown with a friend. Along the way we spotted some fish. More highlights of my family’s visit are seen below. Saturday we had a picnic at Sheep Meadow in Central Park. Sunday, we went to a barbeque in Brooklyn at Miranda and Alex’s house. They were great hosts and the kids played and played and played. Although most of our activities were centered around two-year-olds, my sister Julie and nephew Blue were able to sneak away for a night in Times Square and also attended a Yankees game on Sunday night. We missed them all a lot when they left Tuesday afternoon. Henry and Blue takin’ it easy. Tired Mae waiting for our ride. More hammock time with Mark. My family from Wyoming arrived on Thursday night and will be visiting for the long holiday weekend. Friday was a nice day exploring Brooklyn Bridge Park. Henry took hundreds of photos during the bbq (mostly of grass and feet) including these images of Eamonn (interspersed with my behind-the-scenes shots of their photoshoot). A party for our friend Joyce in Brooklyn featuring burgers, booze and babies in pools. 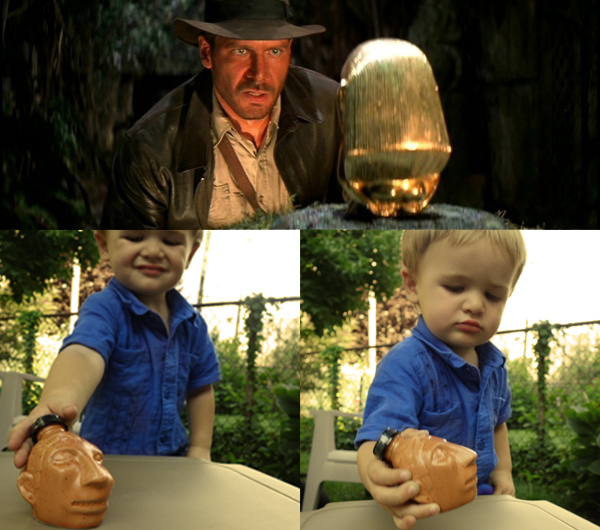 Henry discovers the forbidden ceramic idol filled with tequila. Henry had previously been to Coney Island when we met Jacqui at the finish line of the Brooklyn Half-Marathon, but he didn’t have the chance to visit the amusement parks or play on the beach. Since his cousin Shannon had never been, we decided to pay a visit, making it Henry’s first actual time at a beach and in the ocean. Just in case it was unclear where we went. That’s us in the bottom red car on The Wonder Wheel. Henry was exited to mount a carousel horse. I was there to spot him, but he was steady in the saddle. view from the Wonder Wheel. Shannon on the Q train. Beware the Coney Island quicksand.